When I first began writing seriously about environmental issues several years ago, one thing annoyed me above all else: the refusal of many climate scientists to talk about the policy implications of their research. I'd be speaking to researchers who had documented the rapid melting of alpine glaciers, who knew that it was chiefly due to man-made global warming  but they still refused to talk about what we might be able to do to prevent climate change. To do so would mean going beyond the data and entering the messy world of climate politics  of politics, period. It was much safer to stay within the lines of their chosen academic field and try to let their work speak for itself. In the years since, as I've learned more about climate science, I've found myself becoming more sympathetic toward those researchers who remain reluctant to talk. They may be onto something. Because how we perceive the risk that comes from a potential environmental or health threat  and what we think should be done about it  often has far more to do with our political and cultural predispositions and biases than it has to do with the science before us. Especially, as is often the case, when the science is less than complete. That much has been apparent in the recent reaction to two hot-button topics: the potential carcinogenicity of cell phones and the potential risks posed by fracking for shale natural gas. Let's tackle the concern over cell phones first, which flared up last week after a group of World Health Organization (WHO) experts classified cell phones as "potentially carcinogenic" to human beings. For many in the field, this was a surprise: before the new ruling, just about every major health organization, including the WHO, had said there was no evidence that cell phones might be harmful to human health. Then, quite suddenly, the international experts, whom we would expect to know more about the subject than anyone else, said there might actually be a problem. What should we actually think? How worried, if at all, should we really be? The WHO wasn't going to be much help there. Having made its pronouncement, the expert panel refrained from actually quantifying the risk cell-phone users might face. "Our task was not to quantify the risks," said Dr. Jonathan Samet, the leader of the WHO panel and a member of President Obama's National Cancer Advisory Board. "So we're silent on that question." In one sense, the panel deserves credit for only going as far as it believed the data allowed, and no further. But in the absence of guidance from the experts, it is left to us to sort out the risk for ourselves  and that's where cultural values and bias can begin to distort the picture. I noticed that activists and environmental epidemiologists  people like Devra Davis, the author of Disconnect, one of the toughest books on the possible cell-phone-cancer connection  were quick to use the study to condemn mobile phones. It's not hard to see why: if your training has led you to look for the hidden environmental causes of cancer, then you'd likely be primed to believe in the threat posed by cell phones. And if you're naturally skeptical about contradictory research that has been funded by the wireless companies  mobilemakers have been behind much of the research on their industry, just as the cigarette companies were decades ago on lung cancer  you'd only become more convinced. On the other side, many physicists and biologists were quick to reject the WHO's statement, arguing that it was scientifically impossible for the weak, nonionizing radiation emitted by cell phones to cause cancer. (Nonionizing radiation can't pull apart atoms and damage genetic material in the way that strong ionizing radiation and clear carcinogens like X-rays can.) They looked at the handful of epidemiological studies that have shown a positive connection between cell phones and brain tumors as little more than noise, concentrating on what they see as the simple science of the problem. As one skeptical physicist I joined on a radio panel said: "Cell phones physically can't cause cancer. Period." The politics of the problem  the possibility that a powerful industry might control some of the research being done on its products  doesn't enter into their calculations. They're not primed to think that way. The divide is much the same for hydrofracking and shale gas. Many environmentalists have sharply criticized the practice, arguing that drilling can contaminate local water supplies and that producing shale gas will further harm the climate. So it wasn't surprising when they seized on a recent study by Cornell researcher Robert Howarth arguing that shale gas could actually be worse for the climate than burning coal. The study had more than a few data holes, as the authors admitted in their paper, and Howarth himself is on record as opposing fracking. One could imagine how environmentalists might have received a study by a gas industry executive exonerating fracking, but that didn't stop the Howarth study from receiving plenty of press  much more so than a later Department of Energy (DOE) study that essentially contradicted most of Howarth's conclusions about shale gas. (The DOE study found that shale gas is still much better for the climate than coal.) But greens were primed to believe that fracking was dangerous, so they sought out, consciously or not, the science that fit their beliefs, not the other way around. 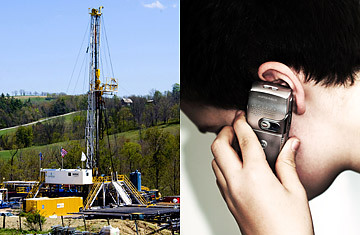 This isn't to say that fracking is definitely safe or that cell phones are definitely dangerous. In both cases the data is sketchy, in part because both the wireless and the gas industries have been less than forthcoming with information. Those gaps allow advocates on both sides a lot of room to run. We want science to give us definite answers, but for problems as complex as carcinogenicity and the climate system, science is often what we make of it. And what we make of it is as much the result of our own cultural values and biases as it is of the data itself. That might seem like a rather depressing conclusion. After all, if we're all just victims of our unconscious biases and our tribal identities  I'm an environmental communitarian; you're a probusiness individualist  what hope do we have of actually finding a common truth? Is there even a common truth? We're not helpless against our minds, though. One way is to try to armor yourself by identifying your own biases and group identities  to be aware of how you're subconsciously filtering the information around us. (The Cultural Cognition Project, put together by a group of researchers led by Yale University law professor Dan Kahan, contains a wealth of research on this very subject.) Another method is simple empathy. Put yourself in the shoes of someone who thinks very differently from you, and try to imagine why they feel the way they do. You may not change your mind, but you might expand it. Of course, the better and more complete the science, the more confidence we can have in facts that have roots deeper than our own biases. We may not be sure about the carcinogenicity of cell phones or the pollution caused by fracking, but we know enough after decades of work to be sure that man-made climate change is a real threat. That's a conclusion we should all be able to count on  whatever our risk perception.